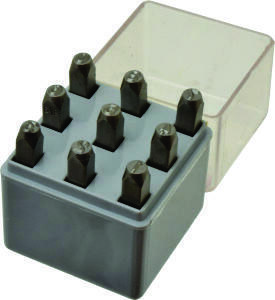 1/32″ Premier number sets contain 9 pieces 0 through 9 (the 6 is used as a 9). 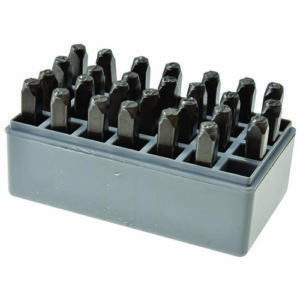 These steel hand stamp number sets are made for hand-held, hammer struck applications. Premier letter sets mark easily into Wood, Leather, Aluminum, Brass, Sheet Metal, Cold Roll Steel, Stainless Steel and Water Oil Hardened Steel.